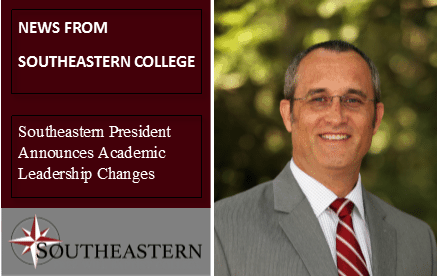 WENDELL, NC—After fourteen years of faithful service, Director of Student Affairs, Professor Ron Davis announced that he will be transitioning to pioneer a new ministry to help remedy the fleeting droves of young people walking away from the Christian faith. Mr. Davis will continue to teach a few classes at Southeastern and will also continue to fulfill his duties in relation to the Youth Aflame Conference. “Bro. Ron,” as he is affectionately known by his students and many young people, has been the visionary leader behind one of the preeminent youth conferences in the country, Youth Aflame. His positive impact on young people and college age students is evidenced by the many Christian leaders who are effectively serving the Lord around the world. Mr. Davis’ students routinely learn Christian excellence by seeing him minister to children in a VBS, drive a bus for a senior trip, preach on a foreign mission field or teach Hebrew or Greek in the classroom.